The marines and sailors who came out of the base were drained and dejected, eager to get away as fast as possible from the scene of their humiliation. 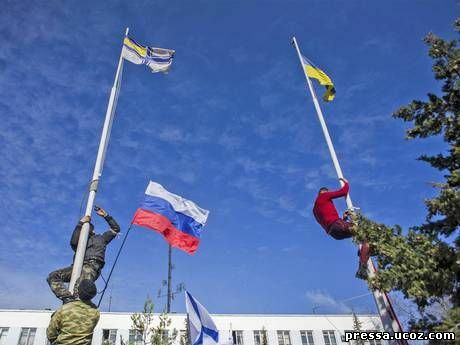 Their Ukrainian base now had a Russian flag flying over it, the entrance guarded by masked troops claiming to be from the Kremlin’s intelligence directorate. Watching them, tears welling, Irina Vorodinova whispered: “I am proud of them. They have done all they could. They shouldn’t have to leave like this.” Her son, a captain, was still inside. Her husband, a retired captain, was at another gate, also anxiously waiting for news. “Our family, our parents, have been in the military. Now our men are being treated like this. It’s not right,” she said. 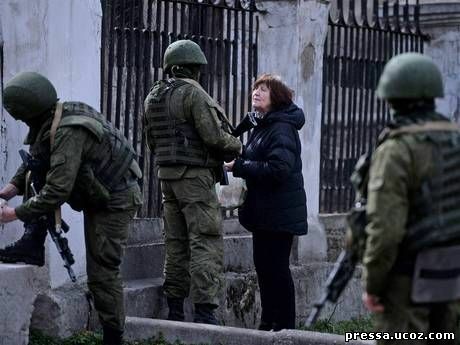 The servicemen and women had mostly put on civilian clothes to leave the Ukrainian naval headquarters at Sevastopol. The few willing to speak, away from the cameras, were deeply apprehensive of the future; some claimed the Russians had broken an agreement to give those in the headquarters more time, and the men who had stormed in had been aggressive and insulting. One, Sasha, said: “ They came in when we were having breakfast and started throwing things on the floor. The fall of the Sevastopol base was a bitter blow to Ukraine: it had been the symbol of a proud fleet and also what was left of the tattered command and control of its forces in Crimea. It saw Ukraine bow to the seemingly inevitable with Andriy Parubiy, its national security chief, saying they were “developing a plan that would enable us not only to withdraw servicemen but also members of their families in Crimea, so that they could be quickly and efficiently moved to mainland Ukraine”. 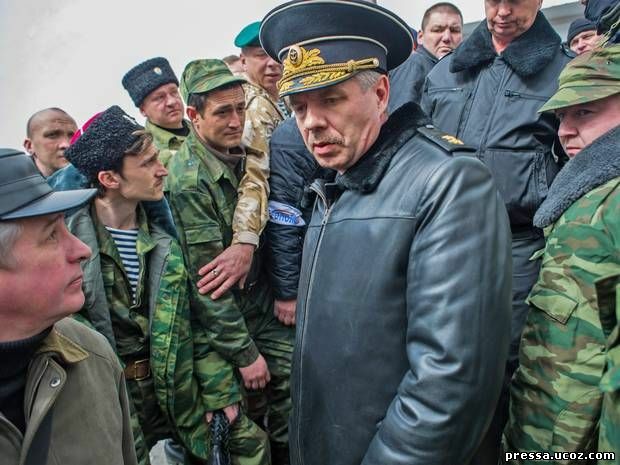 Sevastopol was the main point of communications with the Russians and the man who had been in charge of that liaison, Serhiy Hayduk, the commander of Ukraine’s Black Sea Fleet, is now missing. He was originally held by members of the Self-Defence Force, who accused him of “keeping people under his command prisoners” and threatened that he would face trial. He was said to have been taken away by officers from the Russian security service, the FSB. Admiral Hayduk’s whereabouts remains unknown. The prosecutor’s office at Sevastopol denied reports that he was under arrest facing criminal charges; they also denied any knowledge that he had been taken out of the city. Tonight, Ukraine’s acting President, Olexander Turchynov, gave the Crimean authorities three hours to release the navy chief and “ all other hostages”. It remained unclear what exactly he intended to do if they, and their Russian sponsors, failed to comply with the ultimatum. Events over the past weeks have highlighted Kiev’s impotence in this breakaway state now annexed by Russia. Meanwhile, Admiral Hayduk’s opposite number in Russia’s Black Sea Fleet, Admiral Alexandr Vitko, visited the headquarters to resounding cheers. It is thought that other bases that had been holding out against the Russians may now be taken over. The storming of the Sevastopol base had been preceded by an attack on a mapping and navigation centre in the state capital, Simferopol, in which a Ukrainian officer had been killed and several others hurt. By the end of the day, the naval installation at Yevpatoria was reported to have been taken by the Self-Defence Force. And the garrison at Perevalnoye was reportedly considering handing over the base. Some of those inside were said to be joining Crimea’s Moscow-controlled military; others planned to go to Ukraine. Kiev and Moscow had supposedly agreed a truce over the bases until tomorrow. That appears to have been ignored, although the Russians and their paramilitary allies may overrun them once the deadline passes. After the fatal shooting at the Sevastopol base on Tuesday, Mr Yatsenuyk accused Russia of committing “war crimes”. 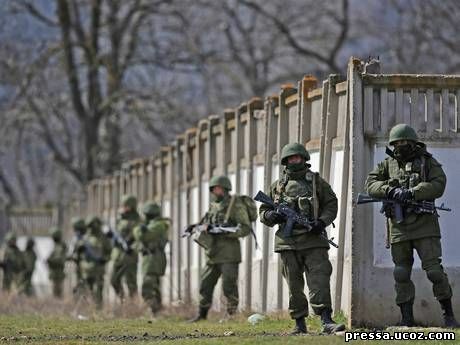 He said Ukrainian forces in Crimea had been authorised to open fire. Colonel Manchur and his men had achieved widespread fame after he marched them, unarmed, up the hill to confront the Russians and their special forces this month.